Celebrate Moomins of the Riviera with Birdkids! Celebrate Moomins on the Riviera with Birdkids! On the 22nd of May, we will be treated to the first ever animated feature to star the beloved Moomin characters created by Tove Jansson. Titled Moomins on the Riviera, this traditionally animated film is based directly on the original comic strip of the same name, and is sure to be a profound treat for Moomin fans both young and old. In anticipation for the release of this extraordinary adventure, Birdkids wants to ensure you and your little ones are all ready for a grand outing with our range of Moomin toys, tableware and greeting cards! The imaginative, thought-provoking and wildy interesting tales of Moomintroll, his family and friend have enticed readers for generations, and so it makes sense that young children would want to take this cute icon of children's literature on an adventure of their own. The Moomintroll soft toy from Aurora is in this regard the ultimate playmate, and is available in either a medium (20cm) or Large (33cm) size. Made of pure-white, soft velvet fabric, this cuddly buddy is perfect recreation of the character; from his hippo-like features to his simple, unassuming expression. Among our huge range of illustrated greeting cards from Hype, we also have a superb selection of official Moomin cards. Taken from the actual books of the series written by Tove Jansson, each card is blank, allowing you to write in your personal message underneath images and scenes from your all-time favourite Moomin story. There's special greeting cards for early birthdays (which come with removable badges!) and for various special occasions, or you can use one as an invitation with which to invite someone to come see the Moomins on the Riviera movie with you. Last but not least, we highlight one of the most delightful ways you can bring all the Moomin characters into your home! Our range of children's Moomin tableware from Petit Jour Paris is too numerous to list here (though we wish we could! ), but as you can see from the products above, there's a great variety in the different ways your little one can dine with Moomintroll and his friends. Available separately or as a set, all the melamine Moomin plates, bowls, cups, cutlery and place mats are BPA free and with a unique image from the stories, whilst the mugs are high quality ceramic. Hugely collectable, there's no better way for your child to grow up with the adventures of Moomin than to have them join the whole family at the dinner table! Created by artist and writer Tove Jansson, the Moomin stories were originally published in 1947 as comic strips in various syndicated newspapers. 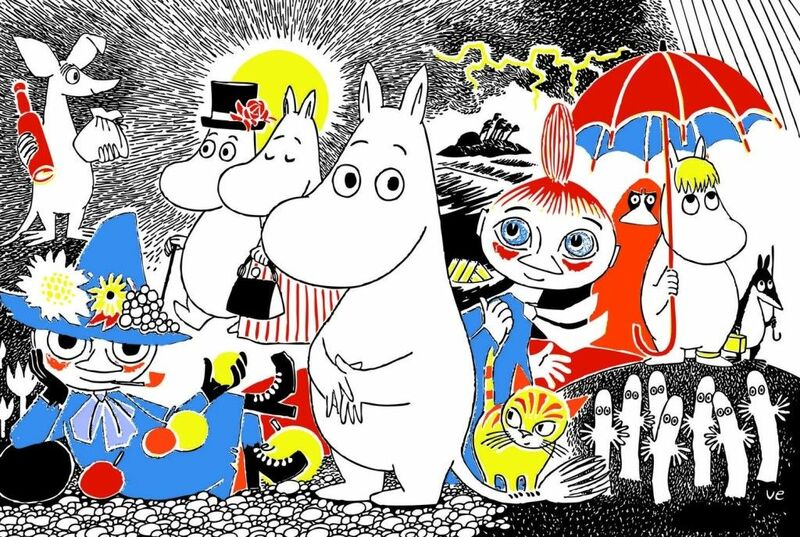 The stories were continued by Tove's son Lars Jansson in 1961, who also went on to develop the hugely successful Japanese animated version of the stories in 1990. The Moomins have since grown into a major stay of pop culture; there's a Moomin World theme park, an asteroid named after Moomintroll himself and their creator Tove Jansson even won the coveted Gold Hans Christian Andersen medal in 1966. The film, Moomins on the Riviera, was first released last year in Finland to mark the 100th anniversary of Tove Jansson's birth. It premiered at the BFI Film Festival last October, where it was positively received, with critic Matt Micucci calling it a "a smart and surprisingly quick witted film as well as the perfect tribute to a celebrated and much loved comic strip." Other critics also agreed that the film's comic antics are perfectly appropriate for children, and that both kids and adults will benefit from the film's deeper messages and profound morals. We'll be posting more Moomin related content in the week leading up to the film's release, so keep an eye on the Birdkids Facebook page, our Twitter @bird_kids or via Google+.